I did a “home stay” at the Gauchan family. 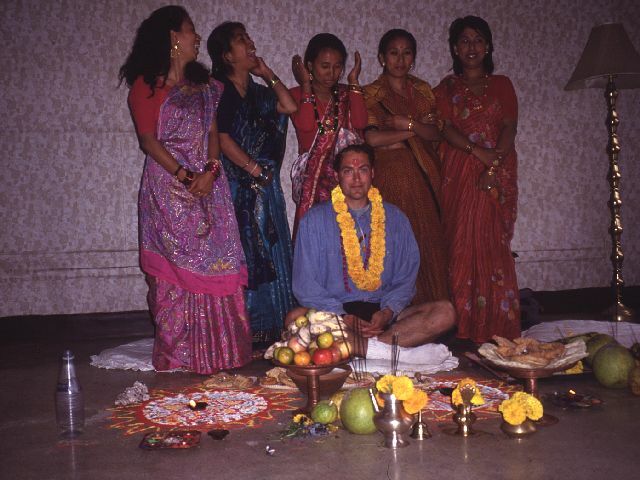 Once a year, there was the “tika” ceremony, in which daughters and wives bless sons and husbands. They had a big family gathering. I went with Manish, the son, to buy the goat. I helped the father and son do the entire butchering process, including making sausages. We took the emptied stomach and made it a funnel to flow the offal – the blood and guts – into the intestinal linings. I was in a little bit over my head, but everything tasted great later in the evening.